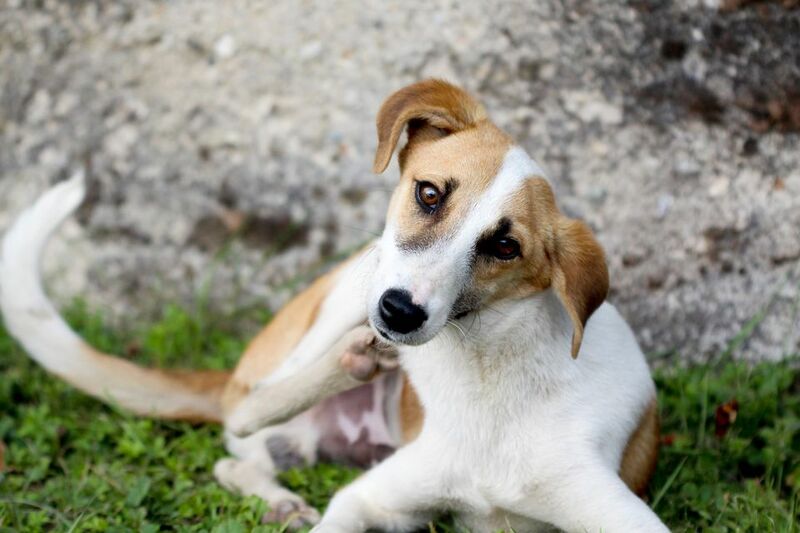 Is your dog uncomfortable and itchy? It may be an allergy! Simply put, an allergy is an immune system reaction. When you have an allergy, your immune system overreacts by producing antibodies -- specialized cells that protect the body from foreign invaders, such as viruses and bacteria. Specific disease-fighting white blood cells, such as eosinophils, also play a role in the development of allergies. Sometimes, these protective cells mistake harmless substances such as saliva from bug bites, inhaled dust, pollen, proteins in food, or even cleaning solutions, as a threat. When the white blood cells think these substances are dangerous, they attack, resulting in inflammation and itchy skin. The heightened response to these substances, called allergens, is what causes allergy symptoms. Dogs and puppies also suffer from allergies. So if you're wondering what's causing your pet's itchy discomfort, here's a look at some of the most common dog and puppy allergies. A flea allergy is the most common allergy that affects dogs. Sensitive dogs develop a skin disease when they react to a protein in flea saliva, and it may only take one bite to provoke all-over itching. The warm summer months of flea season are the worst for flea allergies, but they can develop any time in some parts of the country. The most common sign is extreme itchiness on the rear half of the dog, particularly the area on the back immediately above the tail. Flea control is essential for dogs suffering from flea allergic dermatitis because it only takes a single flea bite to send your puppy into a scratching frenzy. There are many products available to safely eliminate fleas on your dog and in its environment. An inhalant allergy, also known as atopy, is the equivalent of a human's "hay fever." Dogs can react to the same types of things that cause owners to suffer sneeze attacks during the spring and fall months. About 10 to 15 percent of the dog population is allergic to something they breathe from the environment, making inhalant allergy the second most common allergy in dogs. While a few dogs may also develop a runny nose and eyes, the most common sign of canine hay fever is itchy skin. Atopy requires veterinary diagnosis and can be a challenge to control since it’s nearly impossible to avoid the culprits — grass, for instance — in the puppy’s environment. Food allergies are not nearly as common as a flea allergy or an inhalant allergy. If a dog is allergic to something in its diet, usually the culprit is a protein that’s commonly found in the ingredients of commercial pet foods. Proteins are found not only in meats, but also in grain ingredients, milk, and eggs. It can be very difficult to diagnose a food allergy because so many different ingredients make up common pet foods, and even a small amount of an allergen could prompt a reaction. Consult a veterinarian for assistance. Contact dermatitis -- a contact allergy -- in dogs results in inflammation when your dog comes in contact with an allergen. This condition tends to be pretty rare because of the protective nature of your pet's fur coat. When it does occur, you’ll see inflammation where the thinly furred areas such as the tummy or paws come in contact with the floor or ground. What If You're Allergic to Your Dog? It’s a sad state of affairs when the puppy you’ve fallen in love with also makes you sneeze. Allergies to pets can be especially problematic to people with asthma and can affect health all year long. But it's not your dog's fur that's making you sneeze. The pet’s dander -- skin that has been shed -- and dried saliva have secretions that can cause allergic reactions. Consult your doctor and investigate ways to keep your home sneeze-free.